As I was putting this post together, I was kicking myself because I somehow managed to delete all the photos I took with my DSLR. These were all taken with my iPhone X, and they look pretty good, but the DSLR ones were so much better. It also means there's no photos of our starters, so sorry about that. I'll have to go back soon and take some more! When we got there, we had a chat with Ala, the owner who talked us through the history of the restaurant and showed us around. 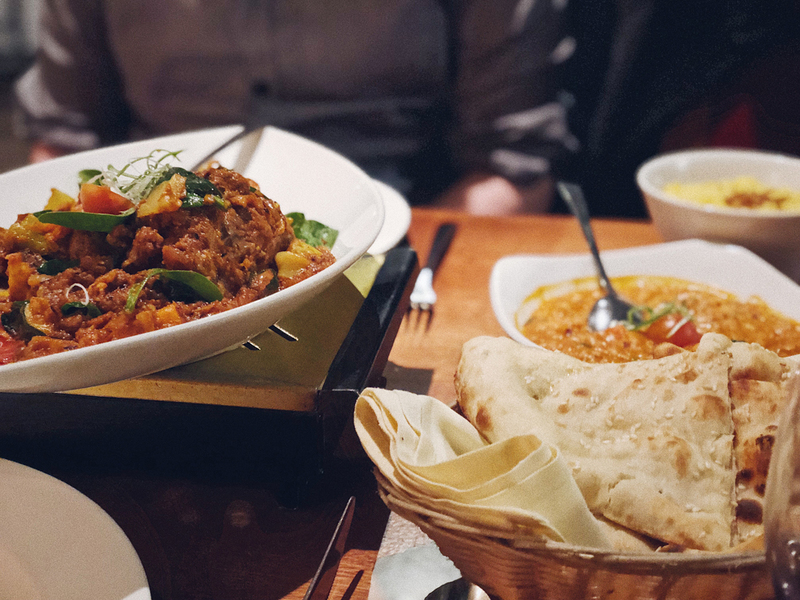 It's been there for over ten years and prides itself on not being like every other Indian restaurant in town - they don't saturate their food in oil, they value quality ingredients and flavour and make sure that, along with the classics, they offer a wide variety of dishes to suit everyone. They're a little more expensive than a run-of-the-mill Indian restaurant, but with good reason - they're offering more. 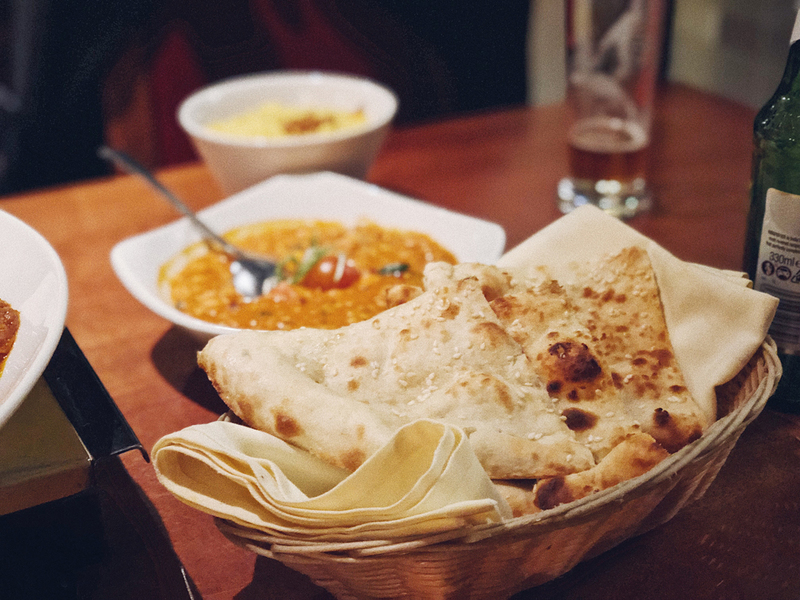 I bashfully admitted that my go-to Indian dish is a korma, and Ala told me not to be ashamed - it's actually regarded as the food you would cook for guests you hold in the highest esteem. For instance, if you had the Emperor coming round, you'd cook him a korma. So that made me feel better about my mild tastes, but I still vowed to push the boat out and order something I wouldn't normally (that said, I 100% want to try their korma, because I bet it's INCREDIBLE). We started with poppadoms and sauces, which I promptly dropped down my top, and then moved on to starters. I feel like I never see duck in Indian restaurants, so got the Hush Ki Nazrana - marinated duck, cooked with cumin potatoes and wrapped in filo. It was delicious - sweet, tangy and spicy with beautifully crisp pastry outside of it. A far cry from my usual onion bhaji. Matt chose King Prawn Suka, which was cooked with garlic and a sweet and sour sauce which he said were really good, with loads of flavours. They weren't your classic takeaway sweet and sour - the flavours were more subtle than that, and complemented the meat of the prawns perfectly. 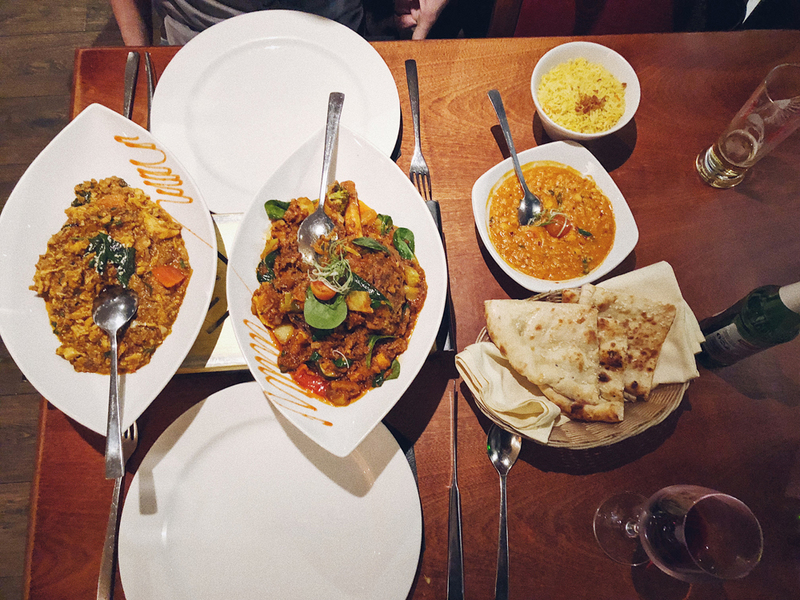 For mains, we chose a couple and shared them, along with a peshwari naan, pilau rice and a dal. 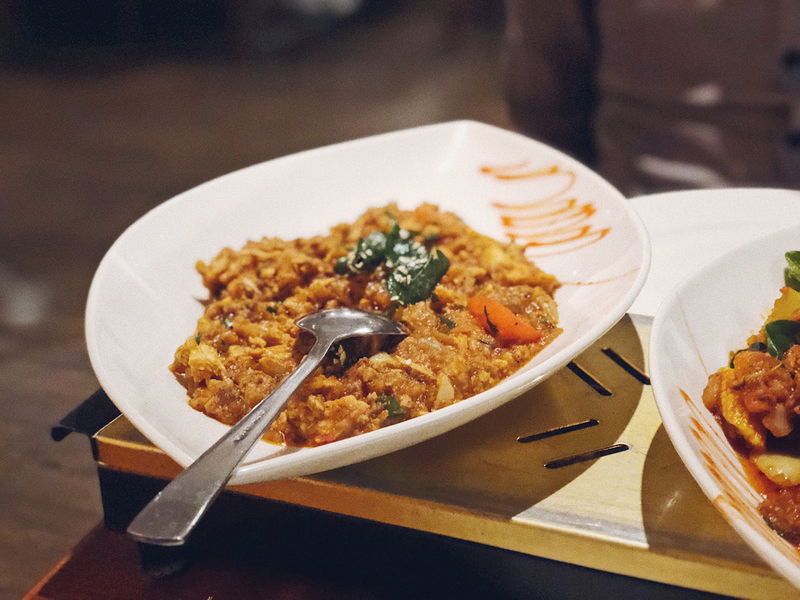 The Dal Bukhara was lentils mixed with red kidney beans, chickpeas and black eyed beans and was incredible although it definitely had a kick to it! It worked really well with the sweet peshwari naan. 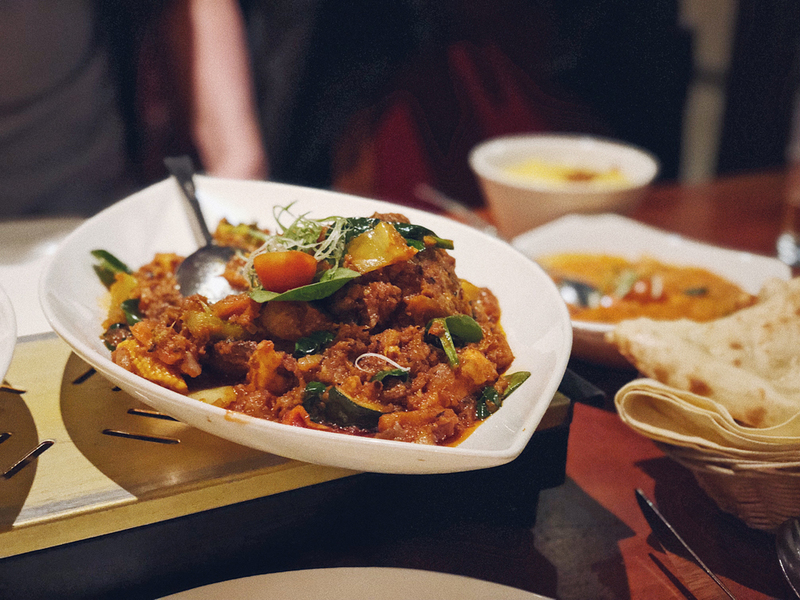 The first main we had was the Simla Murg, which was chicken cooked with minced lamb, almonds and coriander. It was a delicious, rich sauce with lots going on, although I must confess it was a little overshadowed by our second main, which I am still thinking about. So I feel a little bad for it, as I know it was good, but when I think of our meal of Olive Limes, I just think of the Raja Lamb. I quite often order a lamb curry - chunks of slightly overcooked lamb in a korma or tikka sauce, and usually find it a little disappointing. But the Raja Lamb was nothing like this. It was lamb shank, marinated for ages then slow cooked in the oven, served with chickpeas, potatoes and a thick, rich sauce. The meat was completely infused with the flavours of the curry and the lamb was ridiculously tender. Every bite was a total dream. I would 100% order this again, and I would 100% not share it next time. I was intending to get pudding, but by this point was so full I could barely move. So we thanked our lovely waiter (the service was impeccable - and not just for us, I was watching) and staggered home to fall into happy food comas. It was an amazing meal, and I can say with certainty that we'll be going back again and again. And I hope that if you stumble across this review, looking for somewhere to eat in Tring, Wendover, Buckinghamshire or the local area, you'll try out Olive Limes. Just remember to book first - this place is understandably pretty popular. Olive Limes is at 60 High St, Tring HP23 5AG. The restaurant paid for our meal in exchange for this honest review. Aw my parents live in Berkhamsted, the next little town over, so I'll definitely let them know about this place, or take them for dinner when I next visit! Frankly they've been eating at the same four curry houses on rotation for the last decade so it'll be nice for them to have a change! This does look like an absolutely amazing Indian!